Tell us a little bit about yourself and your family. Where are you from / where do you live? What do you do? My wife and I are in our early 30s and have a 2-year-old daughter. We relocated from Connecticut to southern India in May 2016, and are planning to be here for two years. I work in technology and my wife was a recruiter prior to the birth of our daughter (at which point she stayed home to care for her). We've always loved to travel and our current location allows us to take advantage of some easy travel to really unique places. What kind of travel experiences have you had prior to this trip with your family? Did you do other adventurous trips before? Since we've been in India, we've visited Hong Kong, Sri Lanka, Kerala, Goa and London. Prior to moving to India, our more "significant" travel has included ski trips out West (Utah, Wyoming, Montana) and in the northeast (Vermont, upstate New York, Maine), as well as vacations in the Caribbean and Europe. We've always enjoyed an element of "adventure" in our trips, like renting a pickup truck and driving through Guatemala, snowmobiling in Yellowstone, and skiing. But a trek in Nepal is probably our most adventurous due to the physical requirements, length of the trek and remote location. 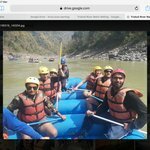 How did you decide on Nepal as a destination? It’s probably more on the adventurous end of the spectrum for things you can do with young kids? 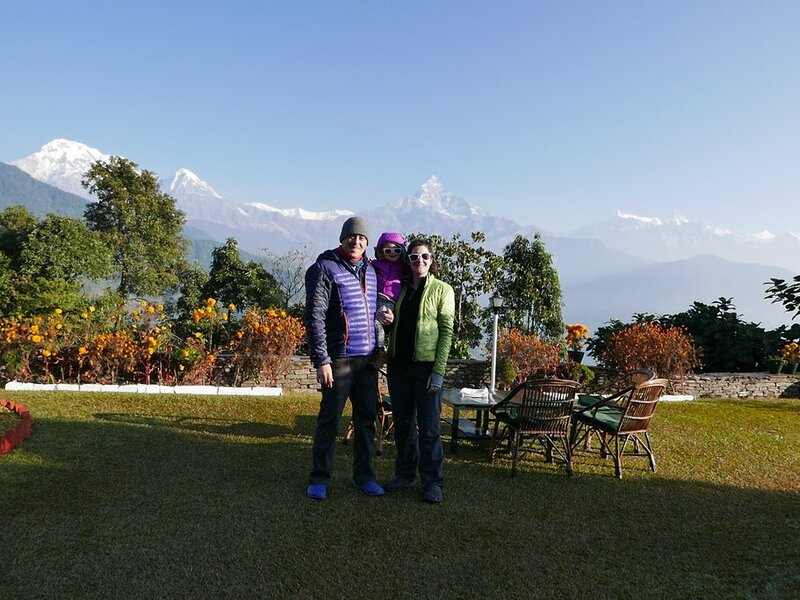 My wife and I love the mountains and figured that this will likely be the only time that Nepal will be this convenient for us (considering that we're living in India). On top of that, my daughter is the perfect age for a trip like this: she's old enough that she's somewhat self-sufficient and young enough that we can still carry her in a child carrier. We also plan to have another child (my wife is now 3-months pregnant), so we knew that the trip would only become more difficult with two kids. Even with my daughter in tow, we've always tried to keep that element of adventure in our travel. By taking the right precautions, we've realized that my daughter is adaptable to different countries, climates and people as long as she eats, naps and falls asleep with us at night. It really doesn't seem to matter where we are in the world. We've realized that the only thing that holds us back from these kinds of experiences is the amount of effort my wife and I want to put in to a trip. Traveling with a child can often be challenging logistically - and sometimes momentarily stressful for us - but as long as the benefits of the experience outweigh the challenges, there isn't much to hold us back. Did you have any specific concerns ahead of your trip? Any specific preparations? Kimkim was a great help in ensuring that all of our concerns were considered, and the itinerary Ngima createdwas perfect. In addition, to make the trek as comfortable as possible for my daughter and I, we used an Osprey Poco AG child carrier and inserted a water bladder to ensure we always had access to water. How was your arrival and stay in Kathmandu? It’s a busy, hectic city. Do you have any tips for travelers who plan on taking their young children to Kathmandu? I'm sure the sights and sounds of Kathmandu can be overwhelming, but we've been living in India for the past six months so this was not jarring for us. The only concern we had was that the roads we traveled were very dusty and the air quality was not great. We didn't spend time in the city - other than driving to/from the airport - and simply asked our drivers to roll up the windows. Our stay at Gokarna Forest Resort was perfect; it didn't feel like we were in a city at all. What parts of your stay in Nepal did you enjoy most? Were there any challenging parts? Did your child have any favorite places, days and/or experiences? The incredible views were as amazing as we had hoped. But we most enjoyed walking through the small villages of 20-30 people and seeing how self-sufficient the people were. It's amazing to see how people can farm, raise animals and protect themselves from the elements in such an isolated environment. The most challenging part was our trek on Day 2, when we climbed ~2,800 feet over the course of 7-8 hours; it was beautiful but physically demanding. My daughter's favorite part was identifying the different animals as we walked through villages. For her, it wasn't a trek, it was a safari (for chickens, goats, cats, buffalo, cows, dogs, birds, etc.). Was there anything unexpected about the experience? Anything you’d wish you knew in advance? I think we were pretty well prepared. We were a bit concerned that carrying my daughter for 4-8 hours a day would leave her with a lot of energy at the end of the day. In addition, because of the "vertical" terrain, there were very few places to put her down to run around. Luckily, she was just as tired as my wife and I at the end of the day, likely due to being in the sun for much of the day and being so excited by her surroundings. Do you have any tips for people who are considering taking their kids on a trek? My wife and I briefly debated if we needed the Osprey child carrier, or if we could use a lighter Baby-Bjorn-like carrier. We're very happy we went with the Osprey, as the Baby-Bjorn would have been much less comfortable. The extra weight of the Osprey was worth it for the storage of additional clothing layers, snacks, water and a sun shade that protected my daughter. We plan to use it on other trips as well.